Update (March 29, 2019): After months of delays and administrative hurdles, the City of West Hollywood rescheduled the screening for April 16, 2019. Pro-Israel groups are continuing to try to push West Hollywood to censor the screening, mobilizing to attend an April 1 city council meeting. The meeting agenda includes a proposal to require city council approval for future events. The council could decide to cancel all scheduled future programming, including 1948: Creation and Catastrophe, while it considers the proposal. Though the meeting agenda refers vaguely to “issues and concerns raised by community members and members of the City Council,” the proposed cancellation and procedural hurdles are a transparent attempt to censor the film screening because of its content. A facially neutral rule adopted with discriminatory intent still constitutes discrimination. The meeting will take place on Monday, April 1 at 6:30 p.m. at the West Hollywood Park Public Meeting Room/Council Chambers at 625 N. San Vicente Boulevard in West Hollywood. Attendees are encouraged to arrive early to reserve seating and time for public comment. To contact the West Hollywood City Council call 323-848-6460 or email council@weho.org. Urge them to give West Hollywood residents the opportunity to see the film and decide for themselves. 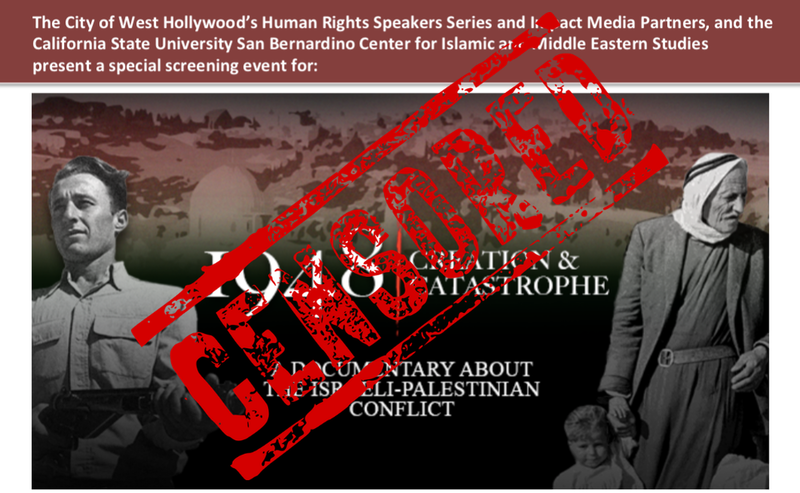 December 4, 2018: The City of West Hollywood has blocked the screening of a documentary about Palestinian history, 1948: Creation and Catastrophe, in response to demands from pro-Israel groups. West Hollywood caved to pressure from Israel advocates, including Rabbi Denise L. Eger of Congregation Kol Ami in West Hollywood, who wrote to city council members demanding the screening be cancelled, denouncing the film and defaming filmmaker Professor Ahlam Muhtaseb as antisemitic. Eger cut and pasted the false accusations against Muhtaseb from the McCarthyist blacklisting website Canary Mission. The documentary was co-directed by Muhtaseb, a Palestinian-American professor of communication studies and Director of the Center for Islamic and Middle Eastern Studies at California State University, San Bernardino. Muhtaseb’s documentary looks at the Nakba, the catastrophe that began with the forced expulsion of 750,000 Palestinians from their homes in 1948. Muhtaseb spent ten years researching and producing the documentary. The film screened at eleven different film festivals around the world and was screened coast to coast in the United States, in England, Italy, Dubai, Australia, Kuwait, Egypt, Israel and Canada. Since its premiere at the Arizona International Film Festival in 2017, it was screened at Oxford, UCLA, UC Berkeley and McGill. Ask whether they watched the film before cancelling the December 12 screening, and urge them to reverse their decision.